Comunicato Stampa: The Culture and Heritage Ministry of Ecuador in cooperation with the Embassy of Ecuador in Rome, and the Ministry of Foreign Affairs and Human Mobility of Ecuador is proud to announce artist Maria Veronica Leon as the representative for the Pavilion of Ecuador at la Biennale di Venezia, the world’s most prestigiouscontemporary art biennial. Ecuador´s official contribution to the 56th International Art Exhibition will be developed by Maria Veronica Leon, a relevant artist for Ecuadorian Art History and one of today most dynamic artists from Latin America. It is also thanks to the efforts of this artist that Ecuador will introduce for the first time its own pavilion at la Biennale di Venezia. For the four rooms of the Pavilion of Ecuador, the artist will create a multimedia landscape with her new video audio polyptych installations, incorporating drawings, video, photography, objects, and sound as interrelated visual techniques, that display, as she says, in a “techno-theater” where water element, as a life fountain proclaims a new state of mind. Her videos are concerned with creating new experiences through the relationship between the viewer’s shock versus unusual projections, and with the way the message is mysteriously inscribed after the experience with the unexpected, creating realities that transform the nature of the object to place it in an unfamiliar context providing it a new identity. Art and Science fuse through dynamic combinations of innovative explorations that materialize into a cutting edge, cautionary vision of the future of Humanity. 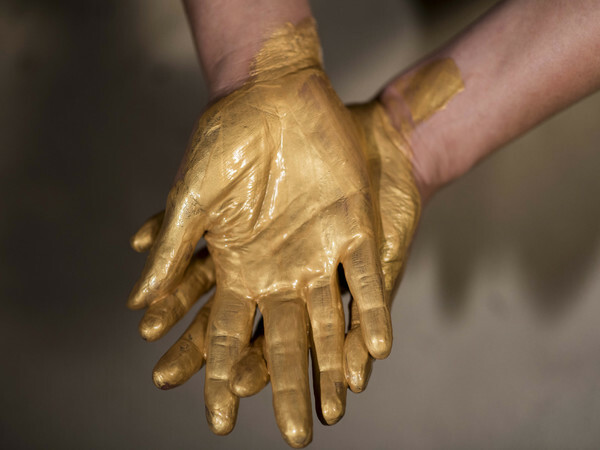 “Gold Water: Apocalyptic Black Mirrors” is inspired by the state of two of the natural primary sources of wealth in Ecuador and the world: Water and Gold, which are extracted from their original context to be critically re-examined through its history, society, economy and culture in relation to global economic values. Both elements, key to the future of humanity, are life sustaining, physically and economically, yet the paradox is that in order to extract gold water sources are often destroyed. In “Gold Water: Apocalyptic Black Mirrors” the convergence of Art and Science forges an artistic amalgam, a prophetic myth of a future dystopia created by man’s annihilation of nature and his blind obedience to consumerism. Starting from this perspective, the Ecuadorian artist explores the mnemonic traces of our relationship with water and gold. Her project is built around a strong symbol: the fireplace, which is cube-shaped like in a hyper-utilitarian modern kitchen. The relevance of this realistic structure lays in its universality, thus enabling the artist to create an original work that metaphorically evokes humanity in the process of forgetting itself. This leading-edge kitchen is the receptor of new artistic dimensions that acts as the medium of a future dimensionality. A wall of a series of micro-waves recessed into rails shows the images of a lost paradise recalling the walls of Plato's Cave. Several videos convert the scenario of a water bottling plant: shuffled rhythms on a metal background give rise to stars that open and transform like new techno-galaxies. Starting from the mechanization of this bottling landscape, this work features an industrial choreography where workers flow to the sounds with synchronized steps and movements. These workers are in charge of bottling the water for its future commerce and their robotic motions are repeated endlessly. This impressive metallic concerto gave the artist the first notes to create new codes for her “techno-constellations”, or metallic visions to impose the last guideline of market demands that enclose the natural pristine virtue of water. Some of the images come from Maria Veronica’s video work in Splendorous Waters Bottling Plant (Splendorous Waters or “Gold Water” are unique in Ecuador and the world in the middle of a tropical rain forest in the Ecuadorian Andes in La Mana, Cotopaxi Province were discovered in 1982). She highlights the dimension of gold through a digital cosmography to place the genuine talent of pre- Columbian cultures within a cutting edge structure, and catapult new ideas and artworks stemming from this process to future cultural contexts. The artist recycles ancestral practices to work with "virtual gold," or artificial gold (acrylics, oils, gold leaf, gold sprays, etc.) giving us the illusion of having easy access to this metal but in actuality mimics only its appearance, its light and its powerful reflections. And the image of this metal will undergo an unusual transformation to give to gold a true artistic value.